A bride may have been dreaming of her wedding since she was a child, but she still needs to connect her dreams and ideas with businesses that can make it happen. That's where we come in! How can you reach thousands of brides each month, 24 hours a day, 7 days a week, 365 days per year? By advertising where brides are routinely planning their big day. Our site is used by both local and destination brides — from down the road to across the oceans, as far away as Norway, brides are looking for vendors on our sites. All of our wedding sites are not only destinations in their own right, they are ranked at the top of Google, Yahoo and Bing — no other advertising medium can give you this continued exposure. Each listing comes with a brief description of your business, your contact info prominently displayed and a link to your website. Are you looking for a cost effective way to reach a wider audience? 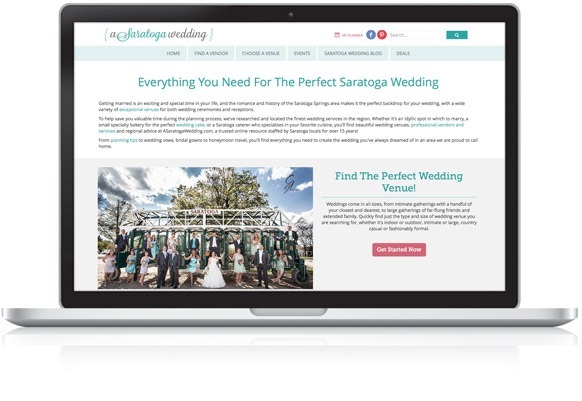 Did you know advertising and marketing your business on our Wedding Guides is often times the most affordable, yet highly successful solution in your marketing mix. It was a pleasure working alongside your team for a few months and I am sad it’s over but we LOVE our new website! They have outdone themselves and we couldn’t have asked for a better group of people to have worked with than the folks over at Mannix Marketing or for a better-looking website, it’s perfect!